Enjoy Disney favorites and comedy classics under the stars all Winter long! 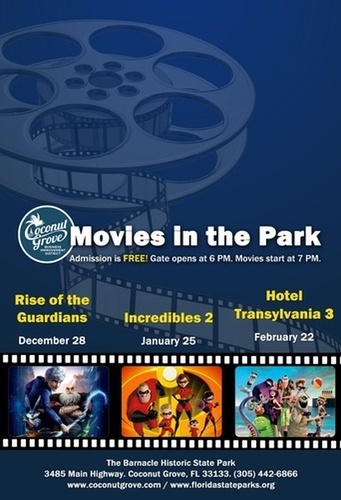 Movies in the Park is hosted on the 4th Friday of each month in partnership with the Barnacle Historic State Park, one of the oldest parks in Miami-Dade County. Bring your blankets and chairs for an evening of movie watching under the stars along beautiful Biscayne Bay. Enjoy Disney favorites and comedic classics. Admission is FREE; a Freebee shuttle service will also be provided before and after the event to and from neighboring parking lots and garages. Bicycle valet will also be available provided by Bike Coconut Grove.